Mother’s Day is tough for me. Since my son Paul’s death, I’m still not over the sadness of being without him on mother’s special day. Yet I look forward to being with my young son Ben and his wife later this afternoon and evening. I know I’ll feel a lot better later on. Ben generously digitized all our family photos from the time Paul was born on December 31, 1971, so I spent the last hour or so looking through them in iPhoto. So many wonderful memories and so many wonderful pictures. 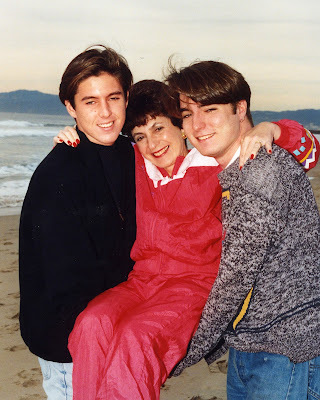 Here is my favorite – taken in 1991 at our beach by the late Mary Pat Dorr – a couple of years before Paul got sick with bipolar disorder. It was a truly beautiful afternoon. “Keep all special thoughts and memories for lifetimes to come. Share these keepsakes with others to inspire hope and build from the past, which can bridge to the future”. Mattie Stepanek. My very best wishes. Jeff. I came across your story and plan to read more blog posts from you. I don’t know enough information, but I saw that it said your son developed bipolar disorder. I know how difficult a disorder that is. My family friends have it and I probably have it coupled with borderline personality disorder. Thankfully I am in therapy and on medications. I will keep your son in my thoughts. I know how difficult mood problems can be. Thank you Kathy, Jeff, and Sebastian for coming by Choices. I appreciate your lovely words and the quote by Mattie – a very wise young man. My mother’s day turned out lovely – being with Ben and Marissa is always a joy.